Google has been very smart when it comes to virtual reality. In 2016 Google introduced Daydream, a new virtual reality platform for Android devices that’s built right into Android Nougat. Here’s everything you need to know about Google Daydream. In simple words, Daydream is a new (cool) way to experience games and videos on your phone. It lets you put your phone in a specially made headset and experience a 360-degree immersive environment that allows you to really step into the world. 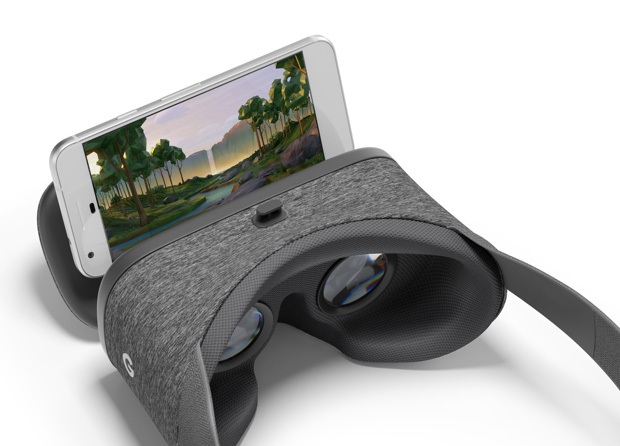 It effectively simplifies access to virtual reality content on Android devices. Daydream Home is a one-stop shop where you can start virtual reality apps or view videos while wearing the headset itself. Daydream View is the first headset built for the Daydream platform. It’s comfortable and comes with a special controller that lets you move your hand in the real world. You can take this headset with you just about anywhere and enjoy your VR experience. The connection between the phone and the headset is wireless and the headset has an auto-alignment system to give clear view of the display. No limitations! You can watch movies with Google Play Movies, watch news stories as though you’re standing where the action is with CNN VR, or step into photos you’ve taken on your phone with VR Photos. Google Daydream will runs apps and games downloaded from the Play Store. If games are more your style, you can sit in the cockpit of a ground-skimming hovercraft in PolyRunner VR, fight hordes of totems and monsters in Hunter’s Gate, or throw spells at rival wizards in Wands. Google’s current list of Daydream apps already includes over 50 titles, with even more planned. Netflix, HBO and Hulu will all have Daydream ready apps in the coming months, plus The New York Times will launch an app too for its VR videos. Like I said, No limitations. Google is positioning Cardboard as the nearly-free thing anyone with any kind of phone can use for VR experiences. If you want to get a better experience from a 360-degree video, Google Cardboard is still the go-to experience. It’s fast, inexpensive, and runs on just about everything. Google Daydream is a more complete experience. When you put the headset on, there’s a whole virtual world for you to explore. Unlike, Google Cardboard, Daydream works with devices labelled ‘Daydream ready’, only. There is an optimal specification list that manufacturers must meet for a smartphone to be labelled Daydream-ready. Although multiple manufacturers could also build their own designs (as long as they meet Google’s standards). Currently, the only phones to support Daydream are the Pixel and Pixel XL, Moto Z, and the ASUS ZenFone AR. The Pixel and Pixel XL were both created by Google and were the first Daydream-ready phones released. If you want the highest quality games with the most immersive experience then portable VR that isn’t going to break the bank, Daydream is what you want. Currently, Daydream View is available for $79 from the Google Store, as well as Verizon Wireless stores.